I'm back to announce the winner of the beautiful Simon Says Stamp July 2016 Card Kit and share a birthday card made using Simon's Retro Thanks Dies and their Birthday Flowers Stamps. So pretty! 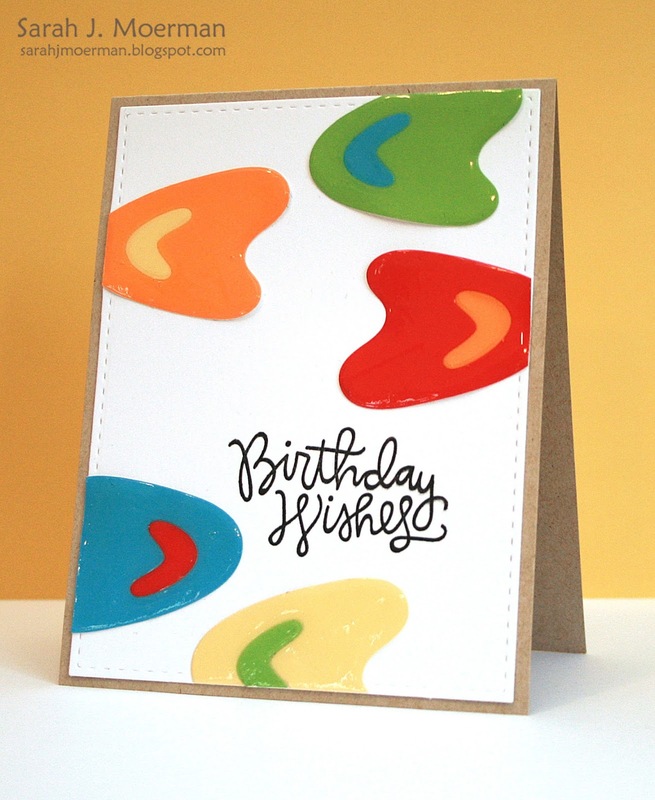 Love the design and splatters! Congrats Lisa! 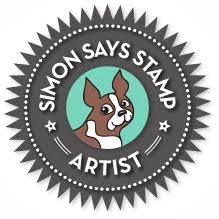 Please contact me via the contact button on my sidebar with your mailing address so I can pass it on to the wonderful folks at Simon Says Stamp. If you're interested, you can pick up the Simon Says Stamp July 2016 Card Kit for just $29.95 + shipping. If you'd like to receive this kit and future kits for only $24.95 + shipping per month, you can SUBSCRIBE HERE. I die cut the large sign shape from various colours of Hero Arts Layering Paper and die cut the smaller shape within each one. I then adhered the pieces to a piece of Neenah Solar White Cardstock that had been cut with one of Simon's Stitched Rectangles Dies. I gave the die cut pieces some shine by covering them with Glossy Accents. The sentiment is from Simon's Birthday Flowers Stamp Set. I'm back to share a final card made using the beautiful Simon Says Stamp July 2016 Card Kit. 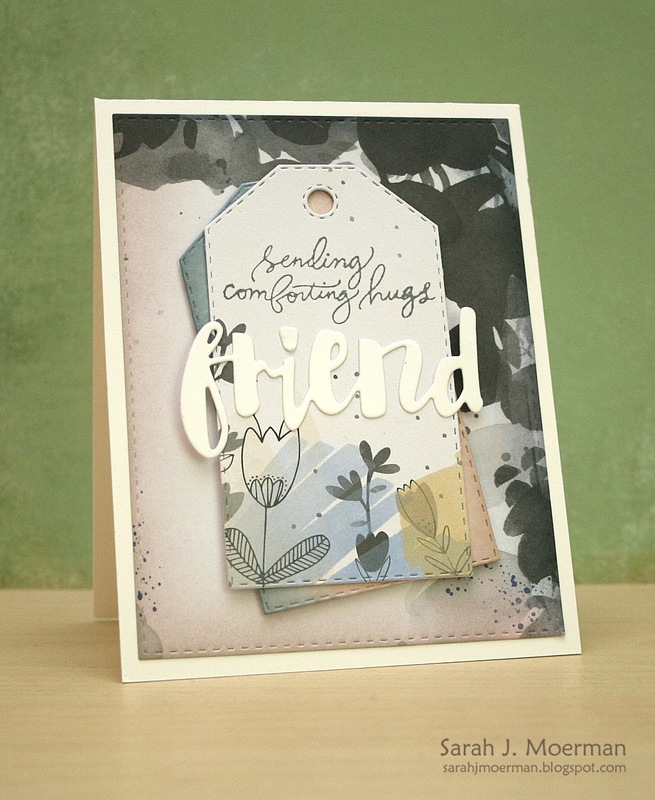 For this card I wanted to focus on the beautiful PinkFresh Indigo Hills patterned papers that came in July's Card Kit. I did add a little colour to the edges of the Stitched Rectangle and the bottom Stitched Dress Up Tag using a couple of the Hybrid Inks that came in the kit. 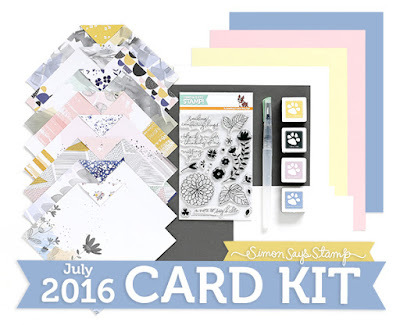 Heidi, owner of Simon Says Stamp, has given me an extra July 2016 Card Kit to pass on to one of you! Just leave a comment on any or all of my July Card Kit posts and I'll announce a winner Wednesday June 29th. I'm back to share another card made using the beautiful Simon Says Stamp July 2016 Card Kit. The card base is made from a piece of Simon's Slate Gray Cardstock. I diecut a piece of Simon's 120 lb White Cardstock with the largest of Simon's Wavy Scallop Stitches Dies and stamped the sentiment from Simon's Handwritten Floral Greetings Stamp Set in Simon's Slate Hybrid Ink before adhering the stamped panel to the card from. I then die cut Simon's Single Roses Dies from a piece of the PinkFresh Indigo Hills patterned paper that had large pink and green portions. Once adhered to the card I added a few stamped accents from the stamp set using the Slate Ink. 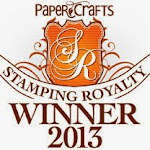 Flash Stamp and Die Sale!